Chief Justice Tani Cantil-Sakauye visits with students from Bellflower High School, which received the Civic Learning Award, created to celebrate public schools’ efforts to engage students in civic learning. Chief Justice of California Tani G. Cantil-Sakauye is receiving the 2016 Brody Distinguished Judicial Service award at Maine's Colby College today. The award honors the work of a former Maine U.S. District Court judge who led an exemplary career as a lawyer, judge, and civic leader. The award--sponsored by the college's Goldfarb Center for Public Affairs and Civic Engagement--recognizes the Chief Justice for her more than 20 years on California appellate and trial courts. The center noted the Chief Justice’s work with judges and lawyers to successfully restore funding and institute reform in the court system. It also recognized her leadership in the development of several outreach programs aimed at engaging youth in civic learning and democracy. On October 6, the Chief Justice will also receive the Legal Impact Award from Advancing Justice – LA. The award is presented to an individual who has "fought injustice, faced discrimination or challenged unconstitutional acts, through lawsuits or legislation that benefit the Asian American, Native Hawaiian, and Pacific Islander (AANHPI) communities, and protect the rights of all Americans." The Chief Justice is being recognized for ensuring the just treatment for all under the law and creating awareness of legal rights. Advancing Justice – LA is the nation’s largest legal services and civil rights organization focused on serving, empowering and advocating on behalf of AANHPI communities. 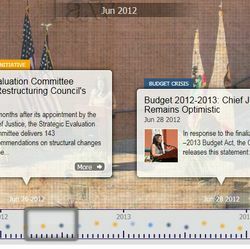 This timeline tracks reforms and progress made to improve California's judicial branch under the leadership of Chief Justice Cantil-Sakauye. Milestones include links to audio, video, and news articles. View timeline.